If you’ve researched other companies, you will see that my sculptures have a very dynamic, expressive quality… versus the typical stiff and stoic expressions you will find elsewhere. These dolls are made from polymer clay, sculpted around a sturdy metal frame. I mix a clay blend that gives the skin a rich look — other places use paint which gives the doll a lifeless, flat look. In most cases, the only paint I use on my dolls is to create the shine dots on the eyes. Otherwise, typically no paint is used on my dolls, unless a small detail isn’t possible without it. Using little-to-no paint provides a clean, quality look. My dolls are also much larger than the average --Bobblicious dolls average 8-9″ in height! I commonly hear from customers that they were pleasantly surprised to see that they weren’t getting a tiny little sculpture, but instead received a real treasure that will be a talking point for years to come. Doctor claims custom bobbleheads improve health! 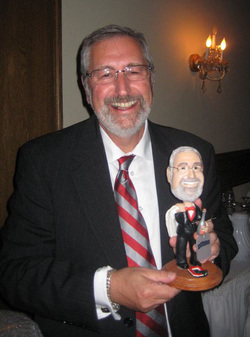 Who wouldn’t want a bobblehead of themself?! This is a hobby of mine that became a small, business venture mostly as an outlet to have more opportunities to create! It started one Christmas when I couldn’t think of a gift for my brother — he’s always jumping at the chance to try out the latest and greatest, so there wasn’t much left for me to do! At this time my brother was in medical school. He would joke that if he didn’t make it, his intentions would then be to become that doctor on infomercials who’s endorsing something. Not long after sharing this lofty ambition with his family, my brother was telling us about his trip to the Football Hall of Fame where he saw a 3-foot tall Brett Favre bobblehead. Voila! — an idea was born! 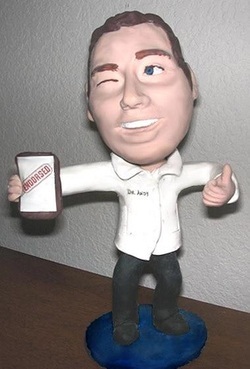 For my gift, I made my brother a bobblehead of himself as the endorsement doctor. Since then I have enjoyed gaining others’ interest in my hobby and developing my own technique for the craft. Later this year I intend on expanding my designs of character bobbleheads — currently I offer laughing Buddha bobbles through my Etsy store (www.etsy.com/shop/magnoliatree)! … And maybe I’ll finally get around to making a doll of myself one day! Each doll takes about 8 – 10 hours for me to complete, and is something I do outside of my “regular” jobs — teaching piano and accompanying. So help the economy and support the self-employed — and become the coolest kid on the block while doing it! Thanks for looking!